jeremyhall2727, Brian Ford, Christine and 12 others like this. I’m glad to see a nice quality of life and maintanence patch between the big updates, makes a nice surprise! 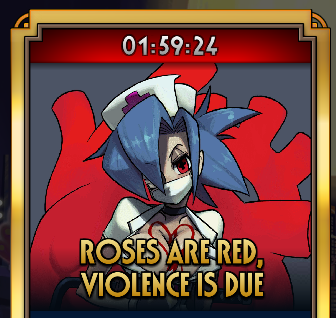 It seems like you guys are trying to mess around with new and quirky prize fights this year, and I’m excited to see what’s upcoming on Valentine’s day for sure. A good update! David Mendez Gurra, TRIX and MightyZug like this. Valentine's Day prize fight to keep me busy from the fact that I don't have anyone to celebrate it with! Just what I needed! Leet, darkice107, Shrillnine370 and 5 others like this. Crystallosx, David Mendez Gurra, Bryan and 3 others like this. What are the prizes offered on the Valentine's day prize fight? Also, super excited about another amazing update! Crystallosx, David Mendez Gurra and Daniel117 like this. David Mendez Gurra, Bradlley Enovânio, Peacockis2cool4u and 1 other person like this. And will there be a push notification to let me know when the server maintenance ends? I hope this next update increase the slots of movements/Blockbusters, I say it for those who collect the degrees of bronze, silver and gold. David Mendez Gurra and Peacockis2cool4u like this. We can download the update now from the App Store. But the game servers are still under maintenance. David Mendez Gurra, TRIX, BlueMusic and 1 other person like this. After updating to the new version, I can't log in anymore. It says error code: -1. We're back up and running! 2.0.2 is live! TRIX, moisterrific, Kyothu and 1 other person like this. Having trouble with the update- download not automatic. should I delete & reinstall the app to receive the new version? When will this be ready to play? Is it normal that when I installed the game suddenly it is updated to version 2.0.3? Error 01 in att 2.0.3 ?